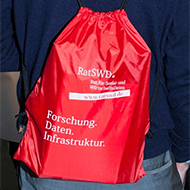 The German Data Forum (RatSWD) hosts the Conference for Social and Economic Data every three years. We require robust and up-to-date research data to fully understand and explain social and economic developments. These data have to be in strict accordance with data protection policies. The KSWD is the forum for interdisciplinary exchange on research data issues in Germany. The KSWD is open for everybody who is interested in research data, including representatives of science, policy or data protection as well as representatives from research sponsors and research infrastructure development. It also serves as the forum to discuss the guidelines for the German Data Forum’s future activities. The election of the appointment proposals for the representatives of the social, behavioural and economic sciences also takes place during the conference. The last 7th Conference for Social and Economic Data (7|KSWD) took place on 8th/9th February 2017 in Berlin.